AirBoss is built with state-of-the-art software development tools, which provide the most possible flexibility in configuration of the operator interface. Rapid schedule changes are affected with such features as direct screen edit, drag-and-drop, cut and paste and other word processing-like features. Air Boss gives you the ability to select media from your database and drop it onto a schedule, which surpasses many other traffic systems. When an on-air schedule is created in AirBoss, one database file is used to contain all of the schedule information. This file is shared across the network with Florical’s AirBoss, AirBoss Editor, and MediaMaster. Florical schedules backup sources so that no operator intervention is required to switch to the backup source. The backup source need not be the same type of device and there is a backup filename field. Many other automation vendors do not provide a backup source field and backup status. This leads them to configurations that mirror backup sources of the on-air commercial playback only. This can only spell trouble. 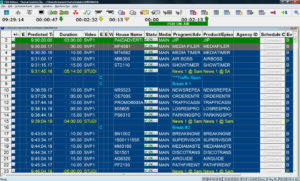 AirBoss allows the operator to put multiple schedules on one screen, using either horizontal or vertical split screens. The AirBoss interface can be sized in two dimensions. The font sizes may be increased or decreased so that you control the amount of data per event on the screen. You can also hide certain data fields. The column width of the displayed fields may be increased or decreased. The sequence in which the fields are displayed may be changed, as well. AirBoss provides a number of word-processor-like functions: block, mark, cut, paste, insert, delete, find, find and replace, find next, and find and replace all. Event drag-and-drop operates not only within a schedule, but also from one schedule to another. The AirBoss Editor window into the database provides exceptional editing capability. When the window is opened, the operator may select a type of material to be viewed (promotions, public service, programs, all, etc.). You can sort the selected material on any column (House Name, Agency Name, Title, Product, Length, etc.). Using the mouse, the operator can select material and drop it into a schedule. Remote AirBoss is an option within Florical’s SMART Central suite of products and can run from any workstation with access to your network. Remote AirBoss includes LowRes Viewer, which accepts WMV9 feeds for on-screen confidence feeds. Remote AirBoss is also capable of displaying and gang-rolling two channels (very useful for “primary/ backup” or X/Y configurations as well as multi-channel systems). Next day’s schedule automatically appends to current schedule without operator intervention. Modular and scalable. Start with one channel and grow to multi-channel central casting system. Full featured control includes quick buttons for “take emergency”, “take black”, take network”, “take backup”, “take switcher off-line”, “hold count-down”, “hold next event” and much more. Intuitive color coding for events and error messages. Metadata automatically inserted in schedule based on housename of event. Parking Spot – unique floating “clip board”. Drag-n-drop to and from the “clipboard” for fast editing. AirGuide – Automatically update EPG. QRCP – push-button controller for AirBoss. Great for gang-rolling channels. Windows XP Pro-SP3, 3.0GHz CPU, 2 GB RAM, 160GB HD X2, RAID1. Multiple Time Zone software with each channel scheduled in local time & seamless Daylight Savings time adjustments. Zero Timing per remote site to automatically compensate for video path delays between source material originating from different locations. Dual Redundant QRCP for push-button event control (Roll/Take, Hold, etc.) of mirrored control systems each with 12 GPOs & four GPIs. QRCP dynamic channel assignment software to gang multiple channels for push-button event control. NewsRepeater: Automatic recording of program segments for playback with new spot insertions; includes (GPI) signals for cable insertion. Device Server with one CPU, WinXP SP3, 16 ports. Control room switching software to reassign control on the fly & handle different mixes of transmission channels at different times. Regional breakaway switching control software to release & rejoin regional channels with the main channel. Schedule & control regional commercials from multiple channels & one program channel. Multiple signal path control from a source router to a cascaded master control switcher. Parking Spot – makes editing on-air schedules in a fast paced environment easy. Alternate events are readily available in a “floating clipboard”. Redundant machine component software for mirrored device servers controlled from the same playlist. Airguide – Automate EPG updates as on-air schedule changes programs. Schedule the shift in advance or on-the-fly. 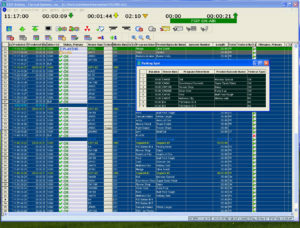 Schedule & control program playback in addition to breaks. Video servers controlled using VDCP protocol via RS-422 include servers from, Avid/Pluto, Grass Valley Group/Thomson, Leitch, Omneon, Pinnacle/HP, SeaChange, 360 Systems and Sony. VTRs controlled using Sony BVW protocol via RS-422. Pro-Bel, Leitch, Miranda, Ross, Thomson/GVG, Evertz 9625, Quartz and Utah. Adrienne, Evertz, Grass Valley Group, Image Video, Leitch, Practel, Probel, Nvision and Videotek. Accom, Kaydara, Pinnacle, Miranda, Snell & Wilcox. Chyron, Clarity, Leitch, Pinnacle, Miranda, Quantel.